A new study from Tulane University’s Education Research Alliance for New Orleans provides new rigorous evidence that a data-driven approach on student behavior and discipline incidents can have a measurable impact on student outcomes. School and community leaders are increasingly concerned about the rates of student suspension and expulsion, and disparities by race and income. At the same time, they are interested in focusing schools on student outcomes that go beyond test scores, such as socio-emotional learning. Improved behavioral management has the potential to accomplish both, by reducing negative behaviors and encouraging non-academic behaviors that are important to long-term life success. 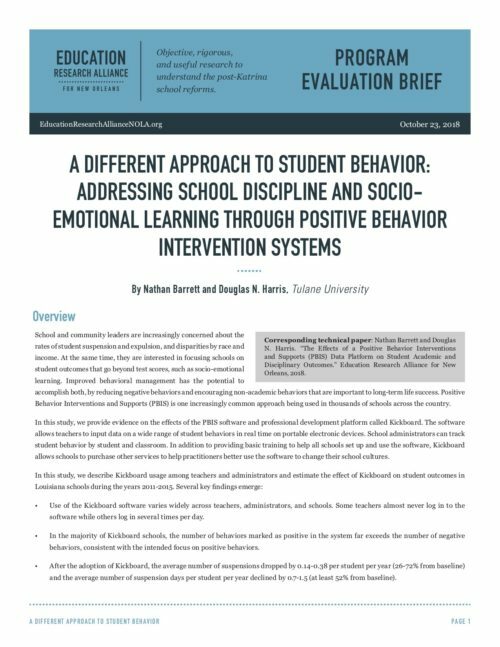 Positive Behavior Interventions and Supports (PBIS) is one increasingly common approach being used in thousands of schools across the country. In this study, we provide evidence on the effects of the PBIS software and professional development platform called Kickboard. The software allows teachers to input data on a wide range of student behaviors in real time on portable electronic devices. School administrators can track student behavior by student and classroom. In addition to providing basic training to help all schools set up and use the software, Kickboard allows schools to purchase other services to help practitioners better use the software to change their school cultures. Use of the Kickboard software varies widely across teachers, administrators, and schools. Some teachers almost never log in to the software while others log in several times per day. In the majority of Kickboard schools, the number of behaviors marked as positive in the system far exceeds the number of negative behaviors, consistent with the intended focus on positive behaviors. After the adoption of Kickboard, the average number of suspensions dropped by 0.14-0.38 per student per year (26-72% from baseline) and the average number of suspension days per student per year declined by 0.7-1.5 (at least 52% from baseline). We designed the analysis to isolate the effect of using Kickboard itself from other factors that may affect student outcomes. Some of the evidence suggests that the use of Kickboard caused the reduction in discipline incidents, but we cannot rule out that the reduction was partly driven by changes in discipline strategies that accompanied Kickboard adoption. While Kickboard aims to affect mostly non-academic outcomes, one possible concern with a reduction in the number of suspensions and expulsions is that keeping students with behavior issues in the classroom may harm the learning environment and reduce achievement for other students. We see no evidence of a reduction in achievement and some limited signs of increases in standardized test scores. These positive findings are generally consistent with other rigorous studies of PBIS, which focus more on the PBIS professional development than software use. While there is still more we need to understand about PBIS, including Kickboard, these results are promising. Tracking student behavior in this way, and using the data as part of larger school culture strategy, seems to offer a way for schools to reduce exclusionary discipline and encourage more positive student behavior.